After arriving at the Istanbul bus station early in the morning I had to hang around until 5:30 waiting for the metro to start. One of the passengers on the bus, an old gentleman who didn't speak English, was also waiting for the metro. He deduced where I wanted to go by my pointing at the city map and saying "Sultanahmet". He walked me to the metro station, indicated the correct ticket procedure, went with me on the subway to the point where I was to change to a trolley, then made sure I made it to my trolley stop. He went well out of his way to help a total stranger, and greatly improved the sour mood I had developed on the overnight bus. I appreciated that; it's best to start a new country with a positive attitude. Sultanahmet is the old part of Istanbul, and has run down buildings converted into hostels, historic buildings converted into expensive hotels, and lots of options in between. I got a room in a place near the bottom of the expense range, an adequate single in the Orient Youth Hostel for 12,000,000 lira, about $18 at the exchange rate at the time. At the current (July 2001) exchange rate I think that price would be under $10. 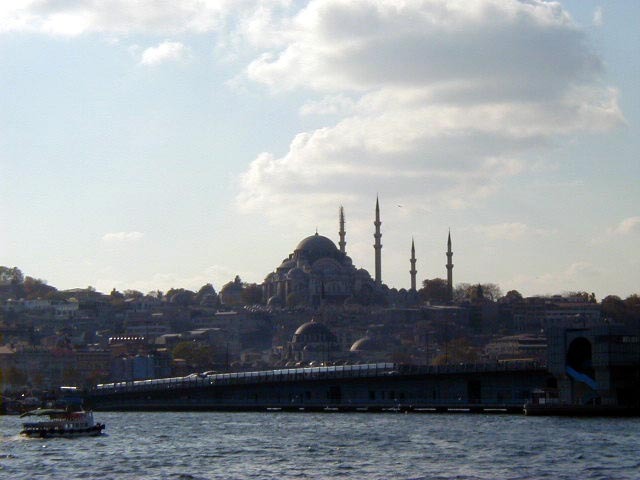 Turkey has an inflation problem, which leads to a zero problem for tourists. It is very easy to mistake a 1000000 note with a 10000000 note. Since one was worth about a buck and a half and the other $15, that would be an expensive mistake. 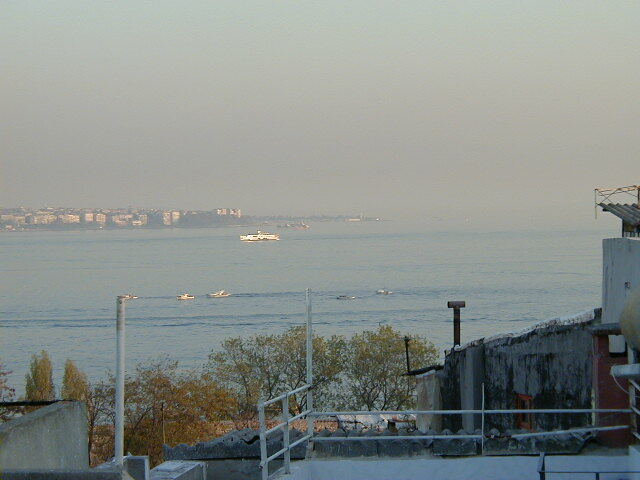 Istanbul would be a great city for visitors if it weren't for the carpet salesmen. Imagine the most persistent, smarmy, annoying salesman type conceivable, then imagine them finding you everywhere, following you around, waiting for you when you leave shops, stepping in front of you as you walk down sidewalks, always smiling and never mentioning carpets--"Where are you from? You are from America? My wife is from America! I love America, I go there frequently. Let us talk about America. Let me give you my card. Come with me and I will give you my card....." I fell for this twice the first day. The card is always at the carpet shop, where you are offered tea as soon as you enter. If you hesitate the salesman will explain it is offensive to refuse. If you accept, the tea won't arrive for ten or fifteen minutes. Sometimes the salesman will disappear to get his card and other salesman will show up with offers of tea. Carpets are never brought up immediately and the salesmen will rarely bring them up directly. This means that if you don't bring up the obvious, that you are in a carpet shop, the afternoon will turn into an endless and pointless social visit. 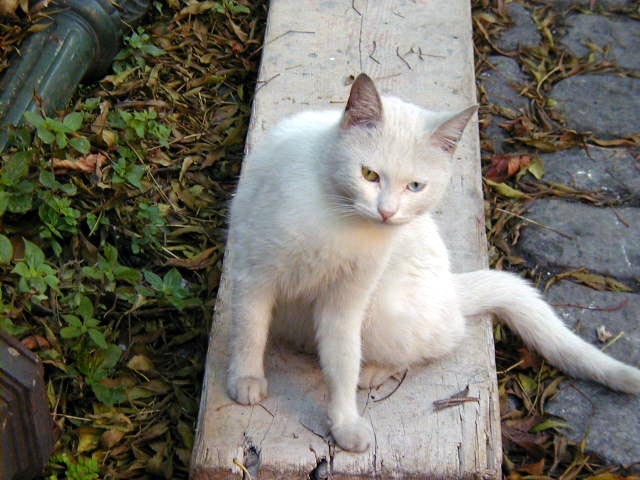 Every polite insistence that you have to leave will be politely countered. Believe me, I tried. I told them I have no money, I have no house, I have no apartment, I have no floor to spread a carpet or wall to hang it on--they still persisted. Urgent looming appointments are met with smiling comments about how there is always enough time for carpets today and appointments tomorrow. There is no polite way to escape these guys. That is what really annoyed me--I'm a nice guy who doesn't want to be rude to people, especially when I'm traveling to other countries. But in the case of the carpet salesmen the only alternative to being rude is to spend your entire stay in Istanbul in carpet shops. I chose to be rude; whenever someone tried to start a conversation with the question "Where are you from?" I would respond "I am from America and I hate carpets". Not nice but effective. And I really did hate carpets by the time I left Istanbul, or at least carpet salesmen. 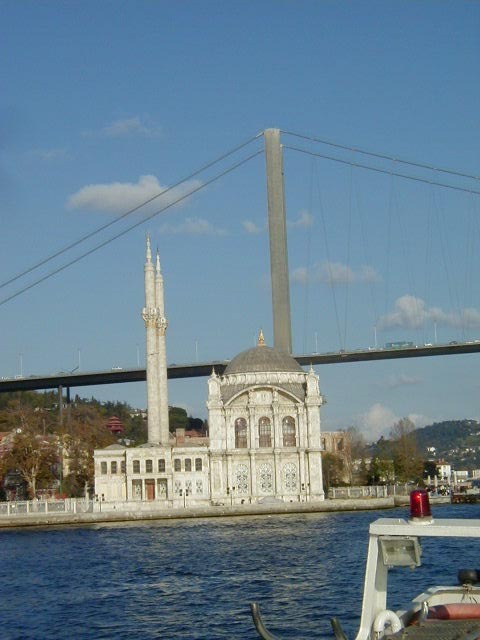 Don't get me wrong, Istanbul is a fun place for a budget traveler. You just need to get around the carpet salesmen. And a smaller number of people trying to sell leather jackets or six ounce Chanel #5 bottles for $8. The bottles said Chanel #5, I don't know what the contents were. The good news is Turkey is safe, affordable, easy to get to (unless you are coming from Plovdiv), and culturally different from western Europe and all those former English colonies (United States, Canada, Australia, New Zealand, those places). But it is not radically different, so it is an interesting change without a major culture shock. 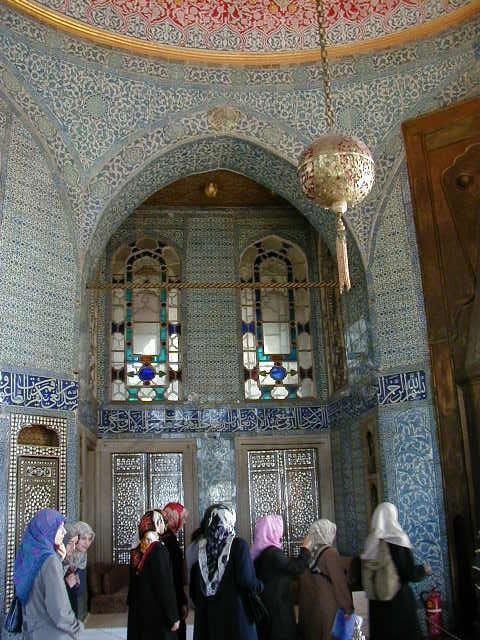 Turkey is popular with tourists who want to be a little off the beaten track but not a lot. It is also popular for budget travelers who want civilized comforts after roughing it. I met some people who had been to interesting places, including Israel when things got overly interesting. One thing I really liked about Istanbul--you can get meals with hot vegetables and interesting spices. In central Europe the diet consisted of pork, potatoes, and bread. Seasoning consisted of pickled cabbage and cheese. I had lived on pork and potatoes for too long; I enjoyed having meals with spices and vegetables. The first thing I did after getting a room was sleep; my usual routine after an overnight bus trip. After that I got a used copy of the most recent "Let's Go Turkey" for $20, which is what it cost new. The bookstores in Sultanahmet stick it to the tourists; used books cost as much as new and new books cost almost twice the publishers retail price. However after visiting Bulgaria and Romania using a guide book covering all of Europe, I wanted to travel with detailed information. Any guidebook that covers all of Europe will have adequate information on major tourist destinations and inadequate information on everything else. Enough information to get you off the beaten path, but not enough information to get you around once you are there. I wanted a guide book with sufficient information to go to anywhere in Turkey. 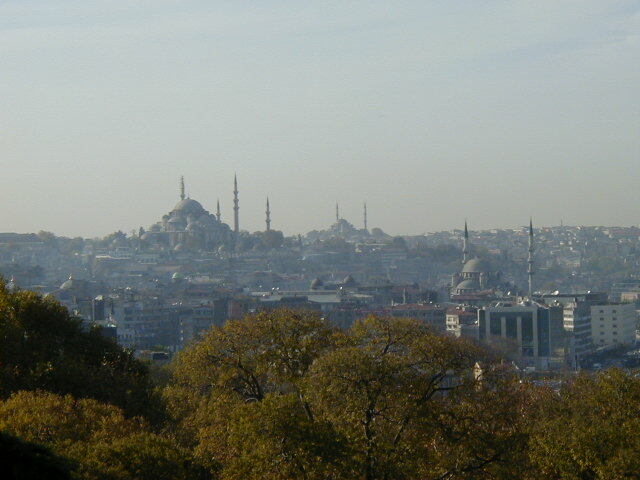 Getting this guidebook was a good decision; Turkey is a big country with a lot to see. 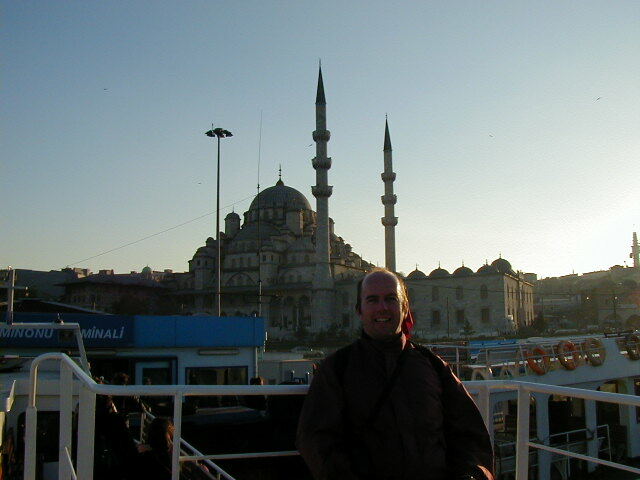 Unfortunately it doesn't have a lot of night life in the places I visited, even in Istanbul. The Let's Go series of guidebooks emphasize nightlife and places "where the beautiful people go", but it appeared the best bets in Turkey are the beach towns during the summer. Since it was November I did a lot of sight seeing and very little else. Now for some pictures. 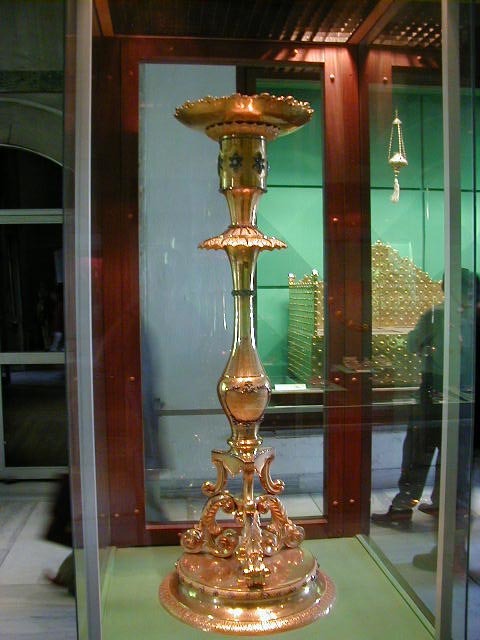 The first is of the Palace Cistern. 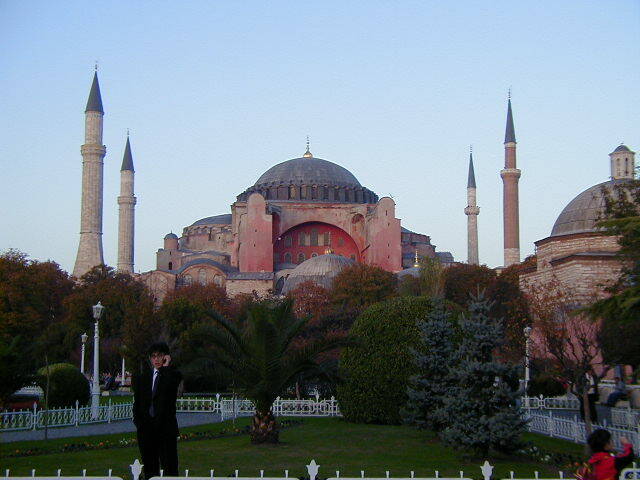 It was built by Emperor Constantine, the one who moved the capital of Rome to the city of Byzantium in the fourth century. 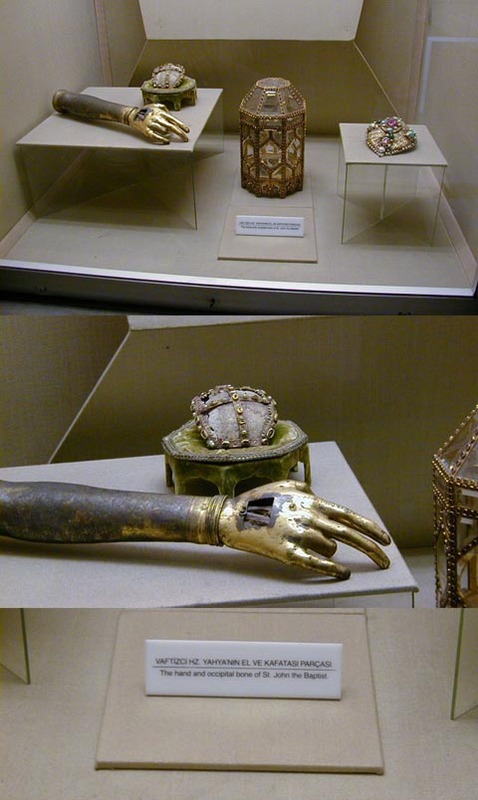 Byzantium then became Constantinople, and after that Istanbul. 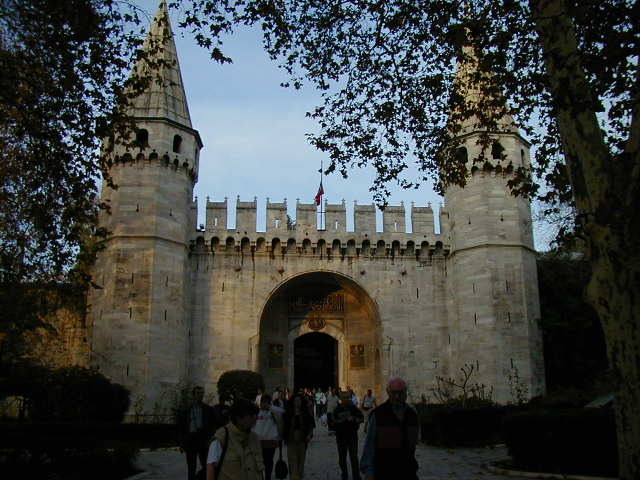 The cistern provided water during the summer and sieges. I ran into it to escape carpet salesmen, a use the original builders probably hadn't had in mind. 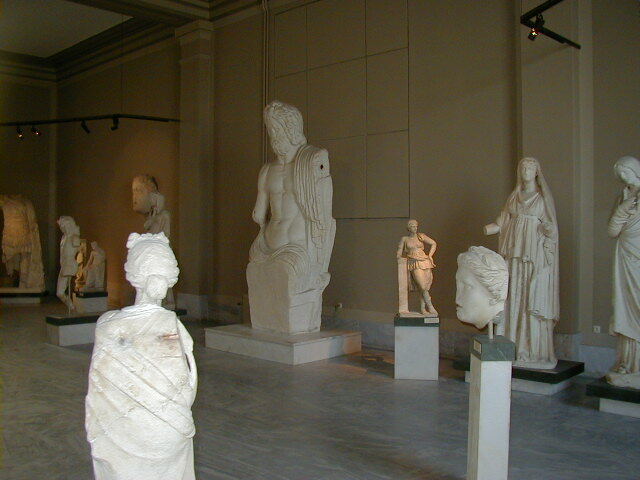 That's an inverted Medusa on the right. I don't know why she is there, she just is. 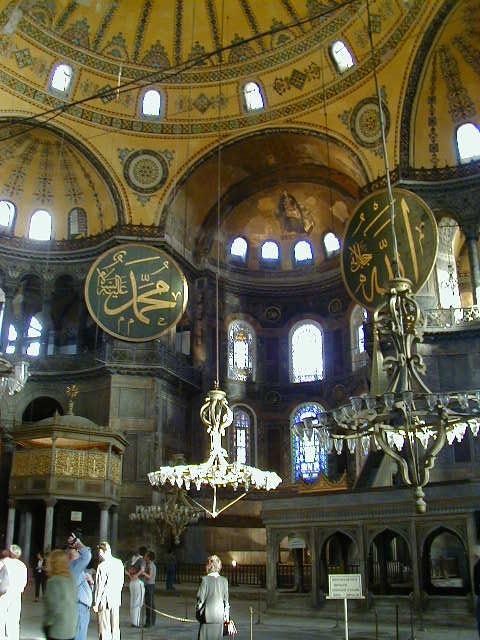 Next up is the Hagia Sofia (Greek) or Aya Sofia (Turkish), or the Church of Holy Wisdom. 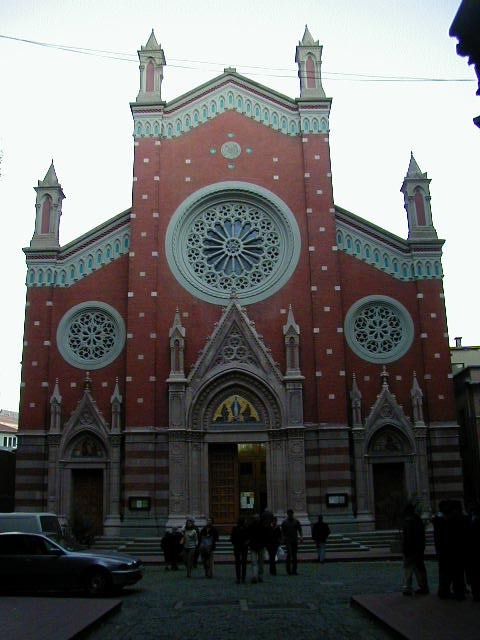 It was begun under Emperor Justinian in 532 and was the largest Christian Church in the world for almost one thousand years. Justinian was the emperor who quelled a revolt by having rioters herded into the city's amphitheater and slaughtered. He then had the church painted red to give his subjects something to think about. Maybe the next meeting of the IMF and World Bank should be someplace with a big red church. 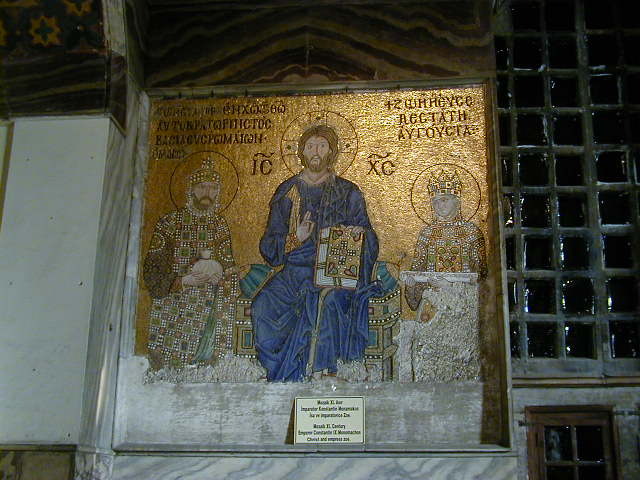 After the fall of Constantinople (if you're a Christian) or the liberation of Constantinople (if you're a Muslim) in 1453, the Byzantine Empire ended, the church was converted into a mosque, and all Christian mosaics were plastered over. 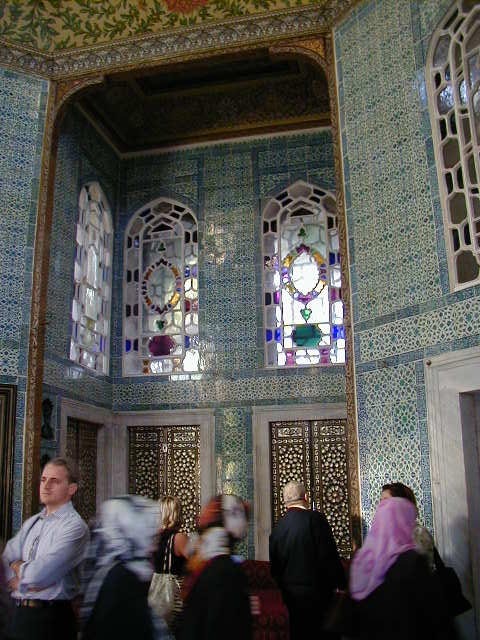 The mosaics were re-discovered in the 1930's and restored. The last picture is of the church's huge second century B.C. 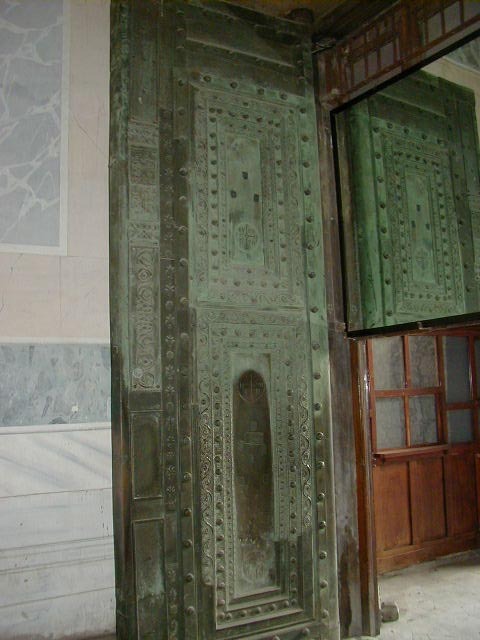 bronze door. Bronze is good stuff, it doesn't rust and outlasts multiple empires. 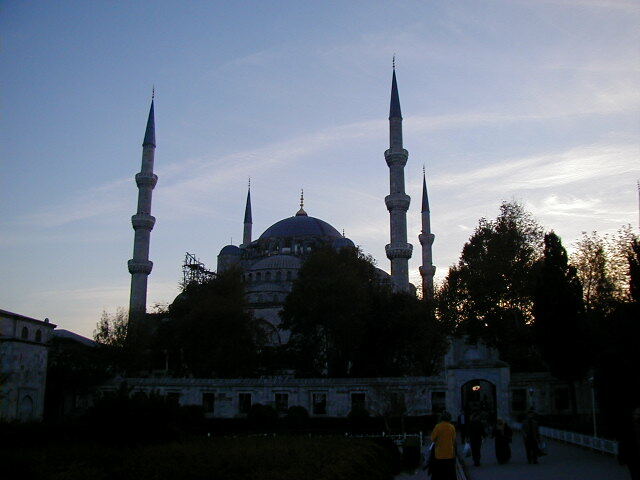 Istanbul's most famous and beautiful mosque is the Blue Mosque. Built between 1609 and 1619 under Sultan Ahmet I, the sultan had to fund a significant expansion of the mosque in Mecca at the same time. 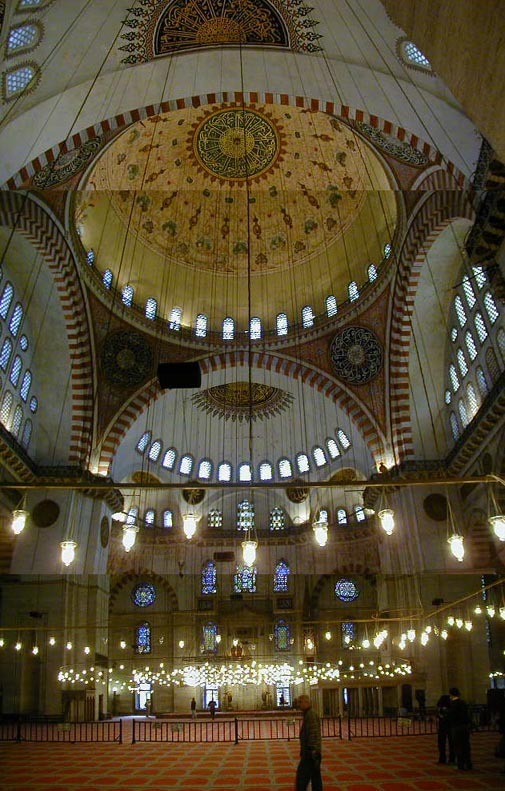 This was to avoid the heresy of building a mosque with more minarets than the mosque in Islam's holy city. 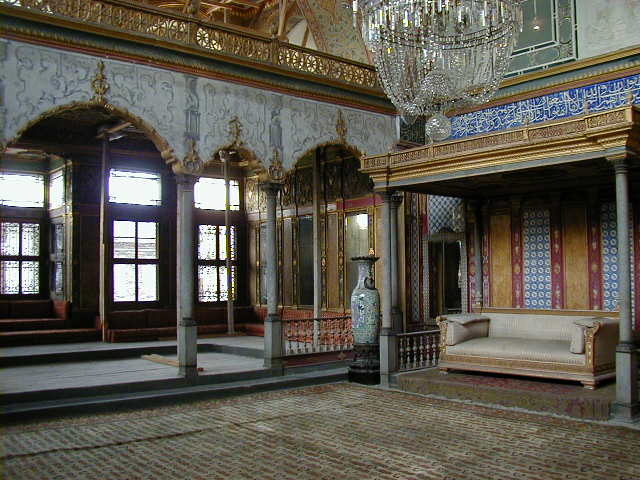 Istanbul's most famous attraction is the Topkapi Palace, used by the sultans ruling the Ottoman Empire from 1462 until the nineteenth century. 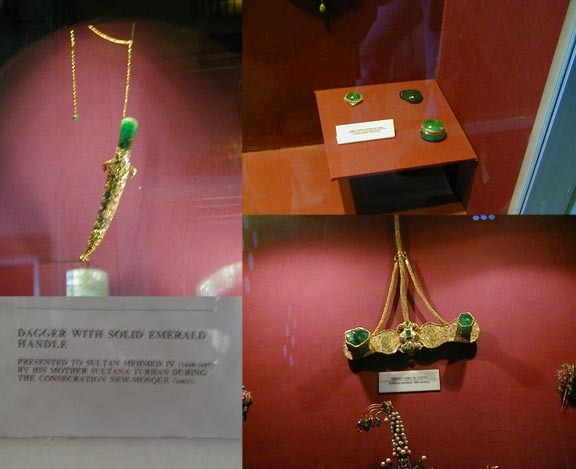 It has impressive buildings and exhibits, including some outrageous gems, a pearl adorned throne, and two solid gold candle holders decorated with diamonds, weighing over one hundred pounds each. It also has what are supposed to be partial remains of St John the Baptist. Maybe, but how do they know? 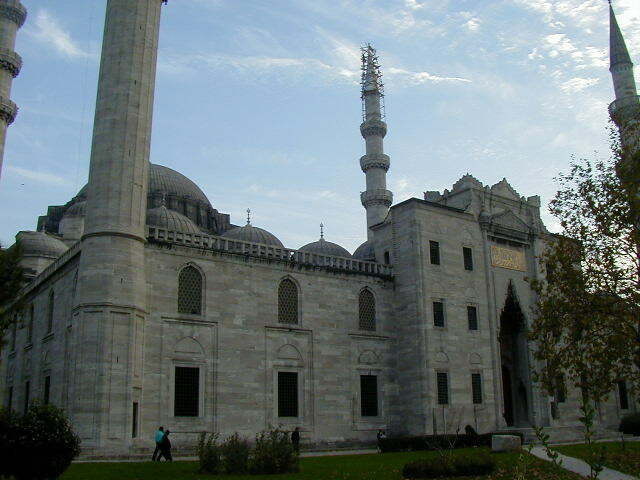 Another mosque worth visiting is Suleymaniye. 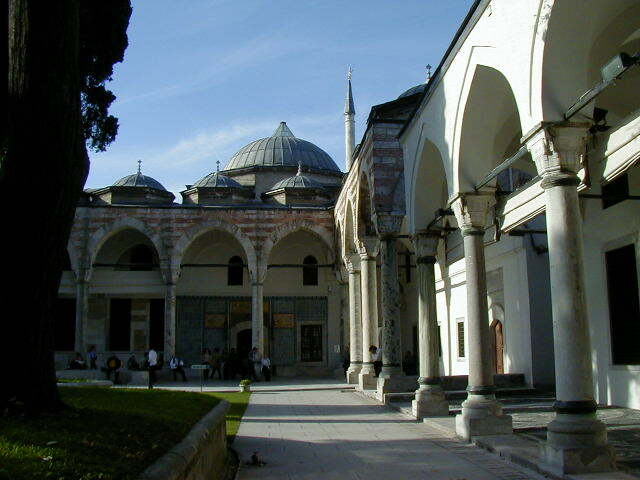 Finished in 1562, my guide book calls it Istanbul's grandest mosque complex. 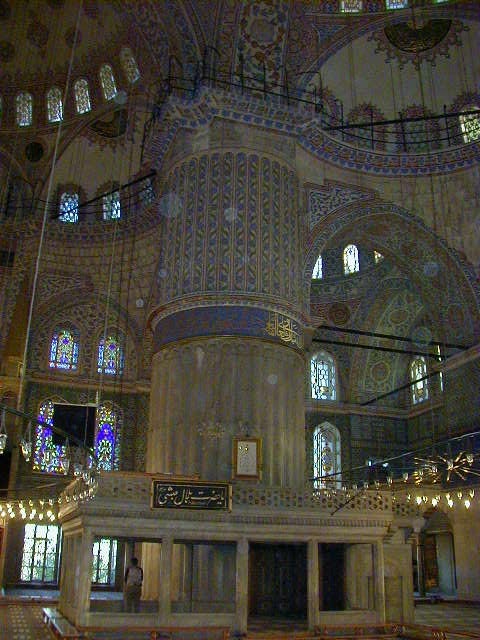 Impressive, but I liked the Blue Mosque better. 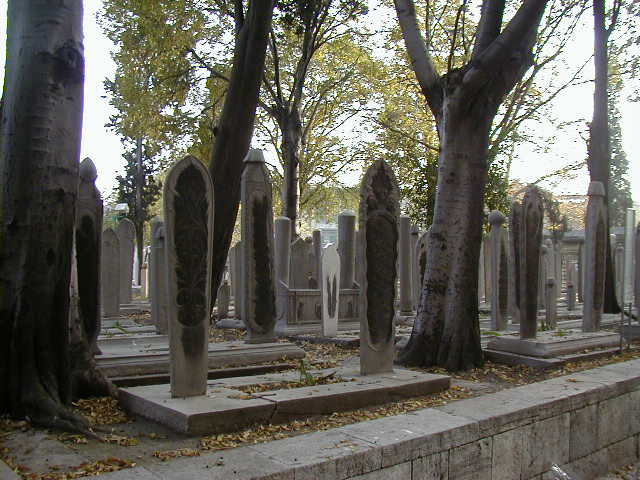 The cemetery has two headstones per tomb; one for the body and one for the soul. I don't know if that is an Islamic or local convention. 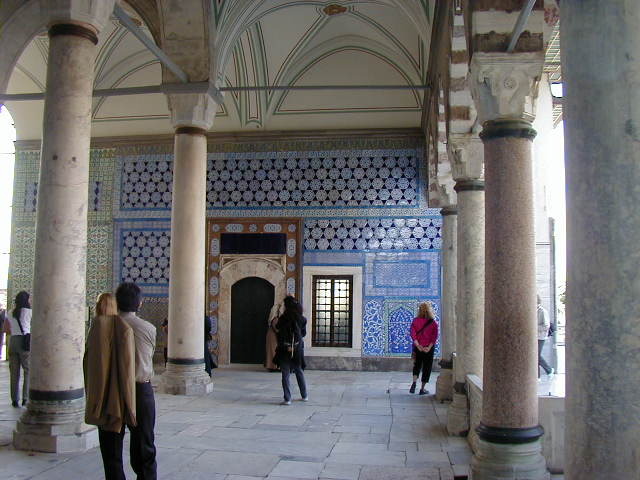 A few random shots around Istanbul; the fifteenth century B.C. 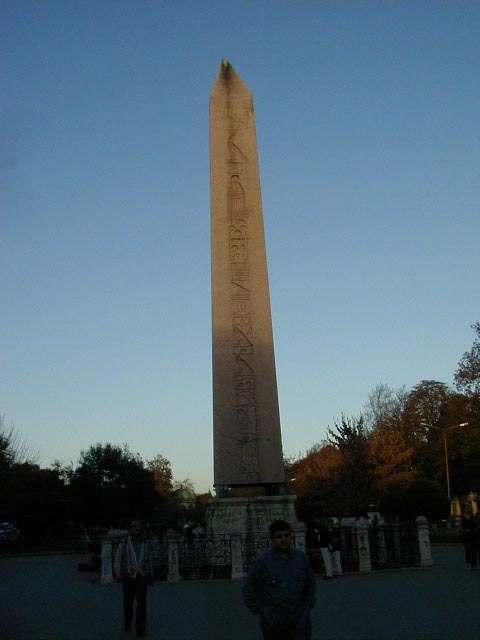 Obelisk of Theodosius, originally in the Temple of Karnak in Egypt (every great city needed some stuff from ancient Egypt); a room in Istanbul's Archaeological Museum (my guidebook recommended it, but I wasn't too impressed); a stray cat that I liked--check out the eyes; the remains of the Roman aqueduct that was used until the nineteenth century; a view of the Sultanahmet area from Topkapi Palace; a pretty Christian Church (no historical significance that I'm aware of, I just wanted to reassure people that Christians are allowed in Istanbul); and the view of Bosphorus from the top floor of the Orient Youth Hostel. 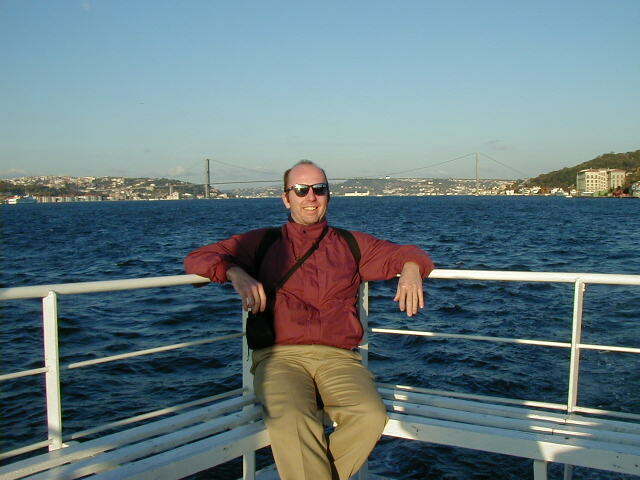 The day before leaving Istanbul I took a ferry tour around the Bosphorus Straits. 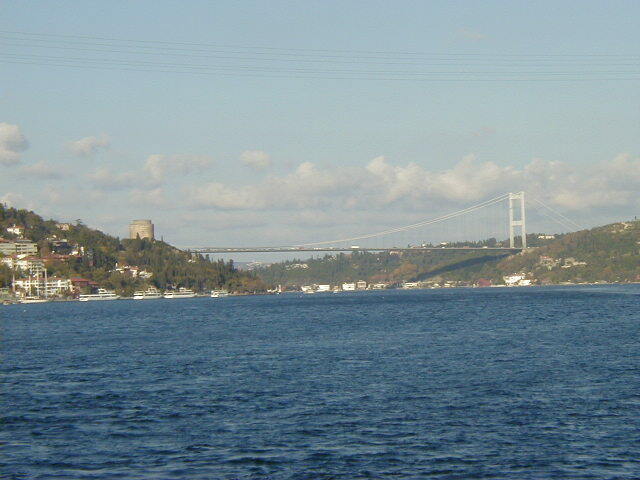 The bridge in the first picture connects Europe to Asia. To reach the Mediterranean Sea and Atlantic Ocean from ports in the Black Sea, the Soviet Union had to send its ships through this bottleneck. That's why all the NATO countries were eager to make Turkey part of the alliance. Maybe not Greece, but all the rest. 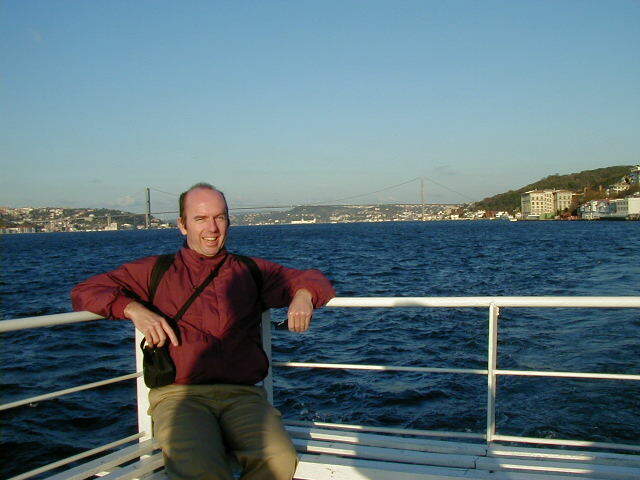 Moving on, I couldn't resist two pictures of me with Europe to my right and Asia to my left. This was mid-November; it was cool, sunny and very breezy, which is why I'm squinting in the first picture. The picture with sunglasses is so you can see me with my eyes open. 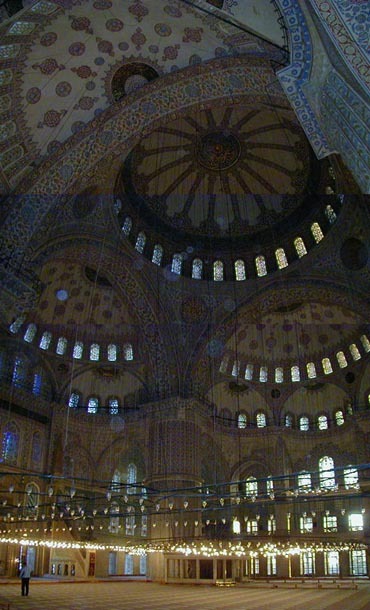 The first and last pictures show the Suleymaniye mosque. Remember near the top of this page when I mentioned how hard it is to tell a 1000000 lira bill from a 10000000? That led to my only rip-off in all the months I spent in Europe. I got a ticket for an overnight bus from Istanbul to Bergama. Turkey isn't as well connected by rail as most of Europe, so buses are usually the only budget choice. The ticket price included a shuttle to the bus station, but the shuttle didn't show up. I waited until the last minute then flagged down a taxi. That was my first mistake; rip-off taxi drivers are always thick in tourist areas--never flag a taxi down in a tourist area, call a reputable company. I got into the taxi and indicated I was in a big hurry, my second mistake. If you are crooked cabby looking for the opportunity to cheat someone, you want to cheat someone in a hurry. They have less time to argue. When we got to the bus station the meter said ten million and change, so I handed him a ten million and a one million lira note, then turned to fumble with my luggage. Third and worst mistake; always watch a taxi driver when handing him cash, especially cash in an unfamiliar currency, and make sure he knows that you know what you gave him. While I was fooling with my luggage he switched the ten million note with a one million note and insisted that I had only given him two million lira. I know that I handed him eleven million lira, but didn't have time to argue and handed over more money. In addition to the irritation of being ripped off was the irritation of having read about this scam in the Lonely Planet Web Site just a few days earlier. But most irritating of all was how obviously happy the taxi driver was about ripping me off. 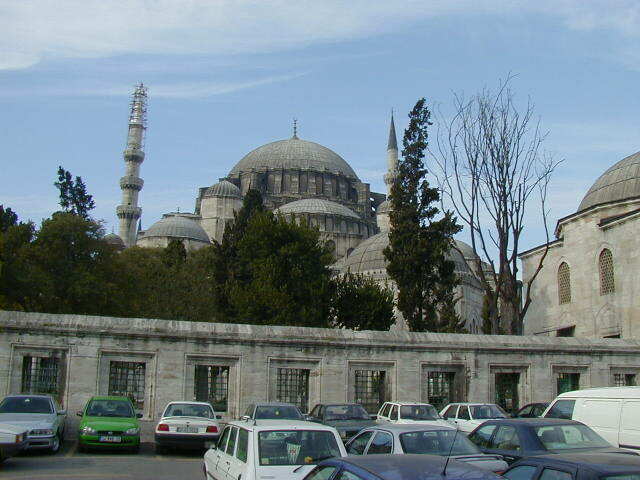 Istanbul is a great place to visit, but avoid the taxis. 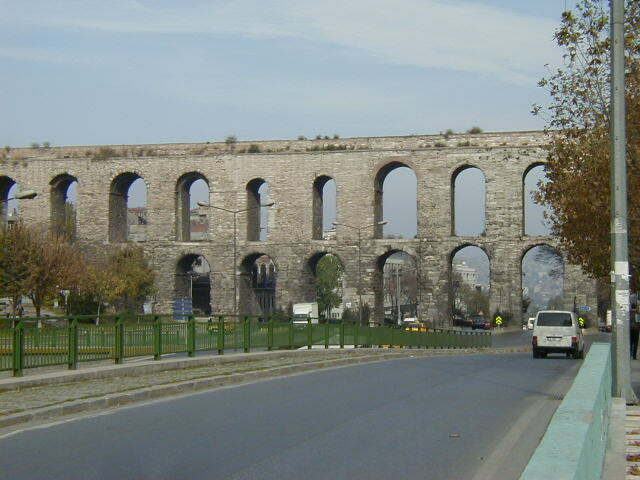 Oh well, travel is a learning experience, and I did make my overnight bus to Bergama.